"You can transform your audio files by, for example, filtering out frequencies, normalizing volume, changing tempo without altering pitch, and applying various 3D sound effects. Those effects can help you improve the sound of a singer's voice and create voices for cartoons and video clips..."
This version is good! I got it downloaded from a promotion program in PC User magazine and now see it listed in CNET. I wanna say that it is great! I have funny time. Wow, it’s funny it changes singers’ voices. 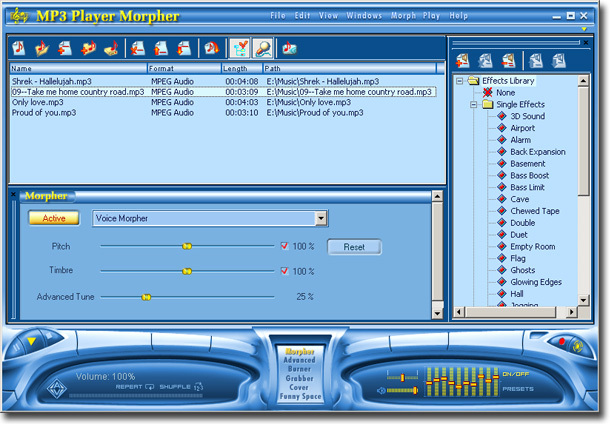 Share your comments about AV MP3 Player Morpher.